April 2010 saw us make a long-desired return to Albania. Although very busy with our convoys to Gaza, and continuing to support community groups in Ukraine, we had long wanted to get back to the desperately poor community of Bathorë. A major NGO in the country, which had been active previously in our area of interest. They helped bring our knowledge and connections up to date. A landowner engaged in building a permaculture-style sustainable farm. 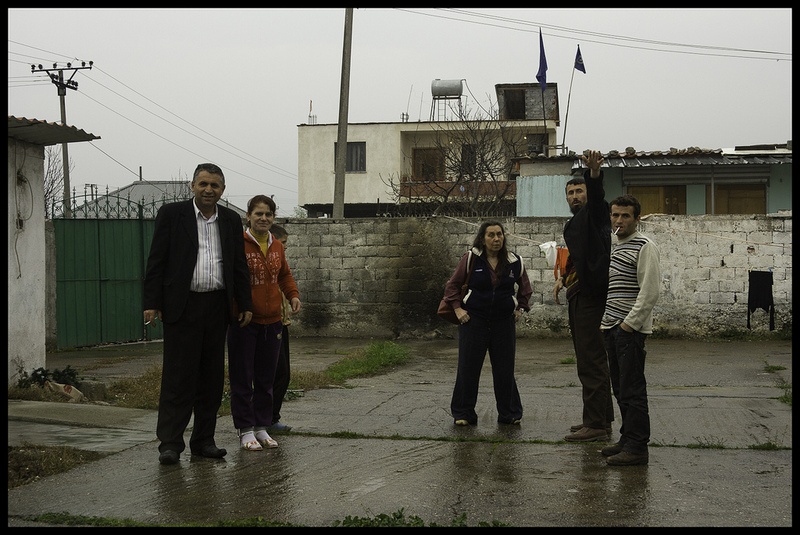 Our old friend Fatmir, a community leader in Bathorë. The mayor of Kamza / Kamëz, the municipality of which Bathorë is a part. We will be working with the municipality to improve waste management and reduce pollution. There is a terrible health problem with plastic waste being burned in the streets due to lack of any alternative provision. We will supply the municipality with a projected three waste disposal vehicles, and work with partners to promote a long term education and provision strategy for greener waste management solutions. We will work with Fatmir to provide facilities for children to play safely in the area. There is a UN-built primary school, but its playground was recently used for another building. Land is at a premium here, with serious overcrowding, and it would be difficult to buy fresh land for any projects. Therefore we have drawn up architects designs, which are currently pending approval, to knock down Fatmir’s house and rebuild a play & day-care centre with an apartment for his family above! We will of course be employing local builders, which will help to inject useful funding into the community. The forthcoming convoy (date yet to be set) will be a fantastic opportunity for new volunteers to get involved. If you’re interested in getting involved, what we are looking for is people who are able to raise funds in their local area; we will be delighted to help you with presentations and events to explain to you and the community what is needed and planned. Our volunteers – i.e. you – then cover all of their own costs including the vehicle and fuel. We help with general suggestions for fundraising and aid collection, and of course we’ll be doing all the paperwork and providing support “on the road”. It must be emphasised though that this really is a collective effort, and we are looking for people who would like to spend some time really getting involved; what we are not looking for is unfunded “spare drivers”, although we are extremely grateful for all the kind offers we receive. This entry was posted in Albania, Listed in archives by Web team. Bookmark the permalink.